557 place | Vector illustration in rank M-rank: Merry Christmas and Happy New Year. Christmas Cute Animals Character. Happy Christmas Companions. Polar Bear, Fox, Penguin, Bunny and Red Cardinal Bird in snow scene. Winter landscape. Merry Christmas and Happy New Year. Christmas Cute Animals Character. Happy Christmas Companions. 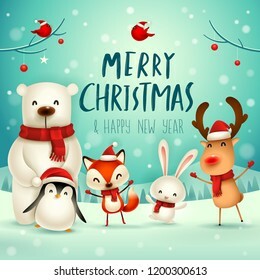 Polar Bear, Fox, Penguin, Bunny and Red Cardinal Bird in snow scene. Winter landscape.